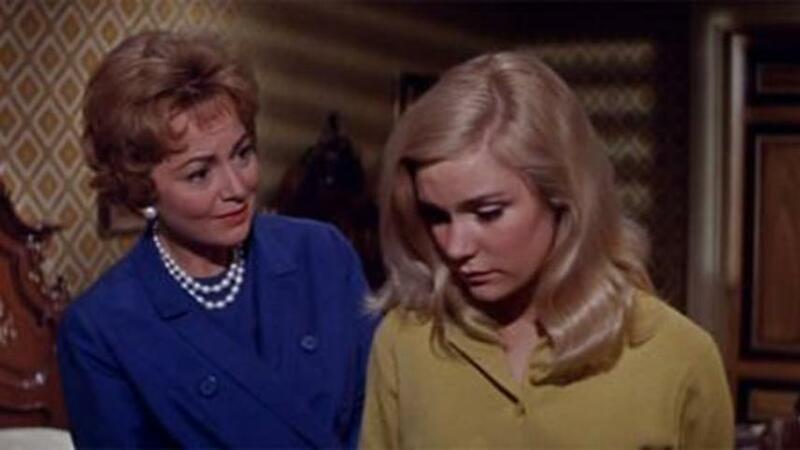 Olivia de Havilland and Yvette Mimieux in Light in the Piazza (1962). Today’s Summer Under the Stars marathon focuses on two-time Academy Award winner, cinematic legend and all-around delightful human being Olivia de Havilland, who at age 99 is still living and enjoying life in Paris where she has made her home since the early 1950s. I have always been a fan of Olivia de Havilland’s, and when I looked at the schedule today to try to decide what to review, I found that I had seen all of the movies on the schedule except one. I came to the conclusion that since I had seen just about everything, I should review one of the more meaningful films on the schedule today, and decided on Light in the Piazza (1962). I have always been fascinated by Light in the Piazza. Made in the days before there was a great deal of advocacy surrounding the rights of individuals with intellectual disabilities, this love story about a young woman with an intellectual disability, her non-disabled boyfriend, and a mother’s advocacy and concern for her daughter is lightyears ahead of its time in many ways. Olivia de Havilland plays Meg, a mother traveling in Italy with her 26-year-old daughter, Clara, whose mental development was stalled following an accident at age 10. Clara meets and falls in love with a handsome young Italian, Fabrizio, who is taken by what he perceives to be Clara’s simple naïveté. Meg wants to explain Clara’s condition to him and his family, but the moment never seems right and she worries about the family rejecting Clara. It becomes clear that she has been rejected several times when suitors find out about her age, and that Meg and her husband have made plans to put Clara in a special care home. Meg doesn’t like the idea of her daughter in such a place, and prefers that she be able to marry, if possible. But the husband is set on putting Clara in a home, so Meg tries to expedite Clara’s marriage to Fabrizio. When Fabrizio’s father sees Clara’s actual age on the wedding documents, he flees, taking Fabrizio with him. Meg is certain that he has a problem with Clara’s condition, but upon a visit by the father, it turns out that he is only concerned with the fact that Clara is older than his son. The issue is resolved, and the two marry. A bit of a saccharine ending, but still a forward-thinking piece on marriage rights for the disabled, and rights to live the life of an individual’s choosing. These are issues that still press the disabled community today, and to have a movie from 1962 highlighting these same issues much of a debate about the legitimacy of these rights, is truly something to think about. It is perhaps fitting that Light in the Piazza, Olivia’s first movie after taking a 3 year hiatus to focus on raising her children, takes place in Europe and was filmed on location in Rome and Florence. The cast has a wonderfully international flavor to it, with Italian Rossano Brazzi playing Fabrizio’s father, and Yvette Mimieux, an American-born actress with French and Mexican parents, playing Clara. Olivia de Havilland, born in Japan to British parents, was raised in California and had become a French citizen. 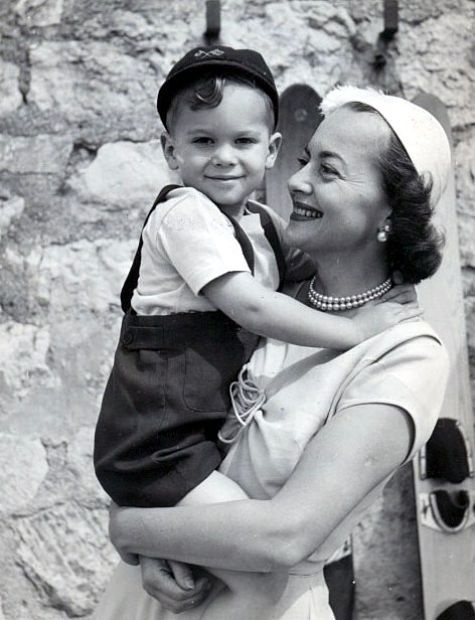 Olivia de Havilland in the south of France with her son, Benjamin Briggs Goodrich, in 1953. On July 1, Olivia de Havilland celebrated her 99th birthday. I had the great honor to meet her in Paris in 2011, and she was exactly as I had hoped–warm and funny, with a voice like melted chocolate. Meeting her remains one of the highlights of my life, as her greatness in person met and exceeded her greatness onscreen. Don’t miss Light in the Piazza this evening at 11:30 PST, and for all those on the East Coast, be sure to set your DVRs. Thanks to Kristen at Journeys in Classic Film for hosting this blogathon!